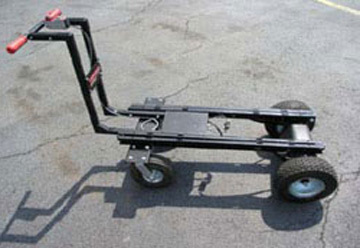 The Journey Begins as passengers and crew busily assemble the equipment. The pilot confirms that the weather conditions are suitable for the flight and briefs the passengers as to the safety procedures for the flight. The set up and inflation only take 15 minutes, however, there are sometimes weather delays for fog in the morning or for winds to calm in the evening. 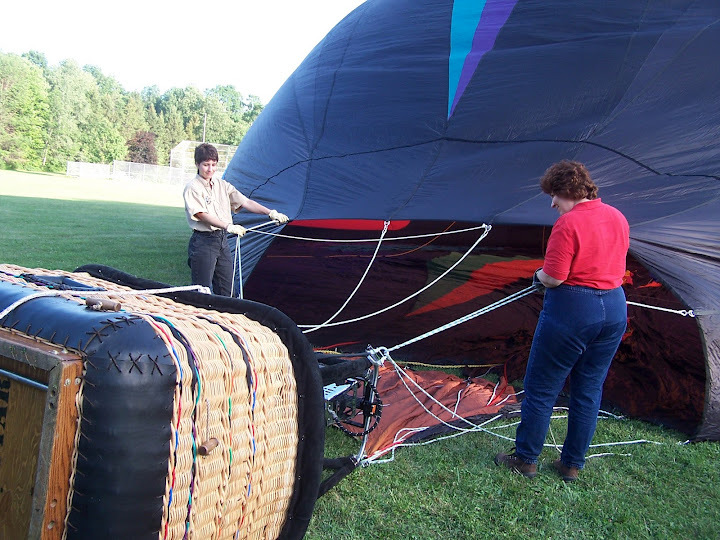 The inflation begins as a large motorized fan blows cold air into the envelope (the fabric portion of the balloon). Hearts race as the seven story Kaleidoscope of colors rises from the ground. After the balloon is fully inflated with cold air the burners are fired into the throat of the envelope. 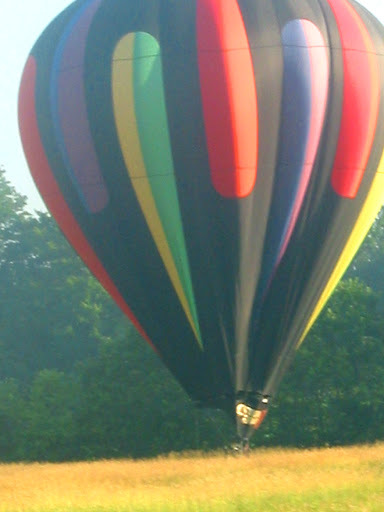 The balloon rises to become upright. Passengers board and the balloon is prepared for flight. The launch is smooth and any breeze ceases as the balloon joins with the wind and becomes one with the sky. 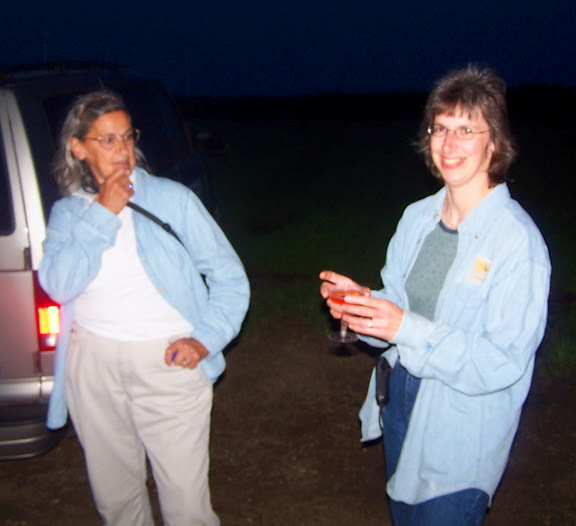 "It's not at all as I imagined" is a frequent route of many first-time balloon passengers. "It's as if you're standing on a platform and the world drops from below you. There is no sense of motion". The rush of emotions calms as a panoramic vista unfolds. The balloon climbs to altitudes of 500 to 1500 feet above the ground. On clear days it is possible to see 100 miles. Most interest is much closer at hand as friends wave (in a balloon everyone is your friend). Dogs frequently bark their cautious warning, though usually not until it's clear that the magical beast has past them by. The occasional toot of a horn or shout from below can be easily heard. The silence between burns is ethereal in its calm. Unlike airplanes, balloons rarely land at established airports. The pilot selects the most suitable landing site. The ground crew, who have followed by the "chase vehicle" on the ground, are contacted to let them know the pilots intentions so they can make contact with the landowner and get permission to use the land. Upon landing, the envelope is deflated and packed into a chase vehicle. This is a job where many hands make light work. Passengers and onlookers are invited to get first hand experience if they're interested. The festivities draw to a close with champagne or nonalcoholic sparkling grape juice and the presentation of the Sky Sail Balloons Inc. Aeronaut pin to proudly acclaim the passengers accomplishment. The landowner is thanked and the passengers are given a ride back to the launch field. The ride back is usually full of stories. The crew collects adjectives about the flight, the highlights have been "Fantandabulus" and "Primordial" and some too salacious for print. We got engaged on the balloon over Chautauqua Lake in July of 2009. It was a GREAT experience - (even for a guy afraid of heights). We both would love to do it again - as an anniversary present some day. Geoff and his team were great! Professional, fun, safe, and educational. This was a once in a lifetime experience and Sky Sail did the best job we could have asked for! We just drove through Albuquerque, NM and saw some hot air balloons over the city! It reminded me of how much fun we had going up in a Sky Sail balloon at the Ellington Fair! 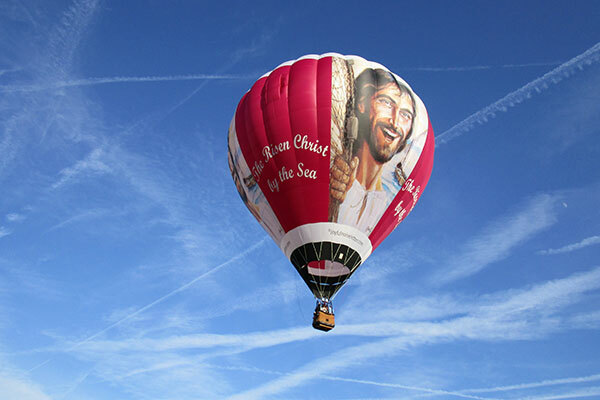 The Balloon features the Jack Jewell portrait of Christ by the Sea of Galilee after the resurrection, where he met with the disciples, and was seen by more than 500 people. It makes every flight easier, and it has helped in the recovery of dozens of landings where vehicle access would have been impractical, delayed, or impossible. It may be difficult to distinguish a true balloon operator from a broker that only sells certificates. These certificates are often not accepted by your local balloon operator.